A youngster who came to Mexico City from Gomez Palacio. Starting as rudo Guerrero Inca. As with some other brothers who go into wrestling at the same time, he and Angel de Oro worked against each other frequently. They took their matches to Mexico City while training with CMLL. CMLL came up with idea of new tecnico Hector Garza leading a trio of three Angels. Oro would be one. Guerrero Inca became Angel de Plata (a name which had been used previously in CMLL.) A third Angel (Angel de Bronce?) debuted with the other two backing Hector Garza to a hair match, but was never seen again. Plata's own debut was delayed by breaking his arm, and existing early match wrestler Angel Azteca Jr. was added to the new Los Angeles Celestiales. The trios teamed regularly, facing the undercard rudos, but did not achieve many notable wins. CMLL felt Angel de Oro was the star of the group and started to separate him from the rest of the trio, while Plata lagged behind both in wins and performance. (Azteca was mostly ignored.) Oro won the Forjando un Idolo tournament, while Plata did not win a single match. Disappeared at the end of 2011 with an injury that was supposed to keep him out a couple weeks, but he did not return. 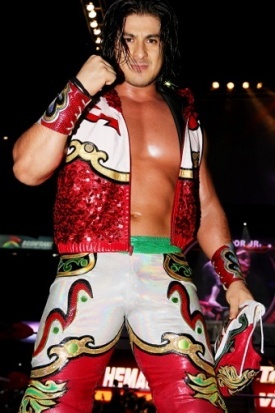 Niebla Roja debuted in spring 2012 as a mystery pupil of Ultimo Guerrero wearing a similar mask. CMLL has yet to officially acknowledge Roja is the Angel de Plata returning to his rudo roots. Roja has mentioned he's a former tecnico who is more comfortable on the rudo side, and CMLL announced have noted he's the son of Apolo Chavez. Roja has said Guerrero's mentoring has turned around his career. He definitely has been a much better rudo, and the relationship with Ultimo Guerrero has led to Roja being part of the 2012 Guerreros vs Guerreros feud. Roja hasn't had any particular interaction with his former partners. Angel Azteca has rarely appeared in 2012. Niebla Roja and Angel de Oro do cross paths as guys booked at similar levels, but there's no acknowledgement of any past relationship. This page was last edited on 16 March 2019, at 00:20.